Take a look at our Manufacturer that makes some of the highest quality mild Hyperbaric Chambers! 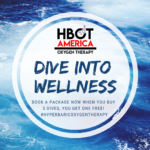 Ask our Staff how you can purchase your own Hyperbaric Chamber! See Dr. Kyle Van Dyke, MD video report on the use of Hyperbaric Oxygen Therapy.